At MOTI, our primary objective is to help our clients achieve sustained wellness. Experience an elevated approach to Personal Training by training with a Doctor of Physical Therapy. We work with people of all ages and fitness levels, helping them to achieve their health goals. We help competitive athletes achieve their goals and gain a deep understanding of how to safely and effectively maintain peak performance levels. Likewise, we work with weekend warriors and recreational athletes looking to regain or improve power, speed, and longevity. We also work with individuals simply looking to improve their health through weight loss, healthy nutrition habits, and healthy fitness habits. Our Physical Therapists develop personalized programs with each individual to help them accomplish their goals in the short term and sustain their goals in the long term. We work with the client to develop safer and more effective movement patterns, as well as helping them to form new, healthier lifestyle habits to serve their overall health and well-being. 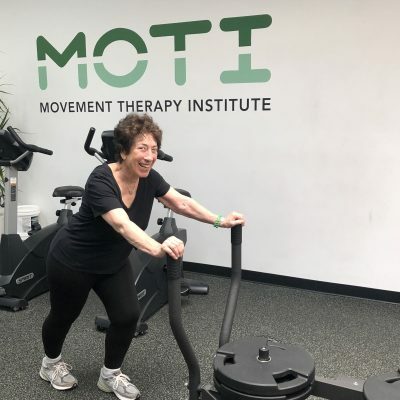 Why should I work with a Physical Therapist at MOTI instead of a Personal Trainer somewhere else? a licensed Doctor of Physical Therapy who can keep a close watch on any symptoms of pain and/or injury and make sure to not exacerbate those symptoms with your training program. Furthermore, your PT will put together a truly expert exercise program aimed at bulletproofing your body and preventing injuries commonly caused by training. Will insurance cover my Personal Training sessions? No. Insurance payers will only cover treatment of an injury when proven medically necessary. Training at MOTI is a self-pay service only. We offer these options to provide the training experience that works best for you. Learn more about our pricing. How do I get started with Personal Training at MOTI? You will begin with a complimentary 30 minute Training Assessment with Director of Performance & Training, Dr. Brian Schwabe. Your journey to sustainable wellness begins with this honest conversation about what you hope to accomplish through your sessions. At this Assessment, Brian may perform some movement tests and/or measurements. You and Brian will work together to come up with a plan for moving towards your goals, and maintaining those goals. After your Training Assessment, you will begin your Training sessions. Frequency of sessions can be influenced by budget and/or what will be necessary to achieve your goals, with consideration of your life style and how much fitness you may practice on your own outside of your sessions at MOTI. What will my workouts be like? The nature of your workout depends 100% on you, what your goals are, and what sports/activities you enjoy. Your PT will put together truly customized workouts and will track your progress from session to session. In many cases, your PT will also likely give you an exercise plan to practice on your own time outside of MOTI. During your session, your PT may employ one of MOTI’s PT Aides to help demonstrate your workout and guide you along the way. Which PT should I work with? Dr. Brian Schwabe, DPT, CSCS has ample experience training NBA athletes, pro volleyball athletes and high level tennis, baseball, and football players. He is passionate about helping athletes of all levels perform at their best. Dr. Ann Degrey, DPT is a passionate sports PT and Trainer who frequently works with professional level soccer and volleyball athletes. She is also a Certified USA Weightlifting Performance Coach who has helped many weightlifters and cross-fitters improve technique and safely reach strength goals. Dr. Nick Cutri, DPT, CSCS has trained many elite high school and college football players and track athletes. Nick has also revolutionized the sport of professional skateboarding, developing original sport-specific training programs for the top athletes in the sport. Are you a golfer? Nick is a certified Nike Golf expert and can help you improve your mechanics to better your game. Dr. Megan O’Linn, DPT, OCS, was a collegiate water polo player and is passionate about training throwing athletes for improved sports performance. She has also become an expert in training endurance athletes looking to improve race performance. ©2019 — MOTI Physiotherapy. All Rights Reserved. Site by Meta Interactive.